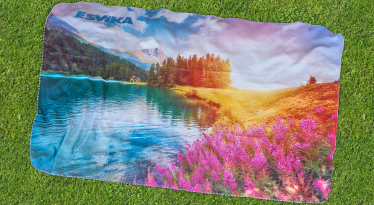 We have developed and produce unique terry towels and digitally print on them images with photographic resolution. 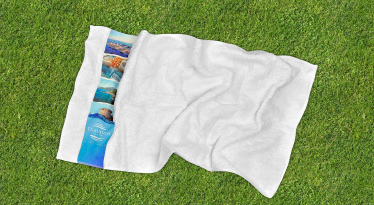 Those can create great promo products for your campaign – be them towels, blankets, scarves, etc. without color limits, 100 MOQ, with up to 1 week delivery. We use one of the most modern ways of branding on solid color blankets and scarves – 3D logo visualizations, making them look both luxurious and discrete. Our clients can now enjoy small order quantities by Pantone with extremely short delivery service. With our last generation embroidery machines we are able to brand all textile groups in our promotional assortment. We created a towel collection with special border for embroidery which looks like an accent on the fine plain border with no shrinkage. 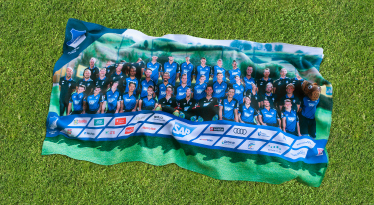 Digital printed beach towels – all sizes available with MOQ 100 pcs and delivery up to week. Digital printed borders – all standard sizes in white kept on stock. MOQ 100 pcs. Digital printed blankets – soft and gentle polar fleece fabric photographic printed with your unique design. Based on long-term collaboration, we serve our customers with highest responsibility, fast information, smart ideas and solutions, which we turn into in amazing final products.